Description: Babar and Céleste go off on a romantic honeymoon in a hot air balloon, but things don't go quite as planned, and soon the two elephants find themselves in a great adventure! Lovely and amusing full-page colour illustrations throughout. 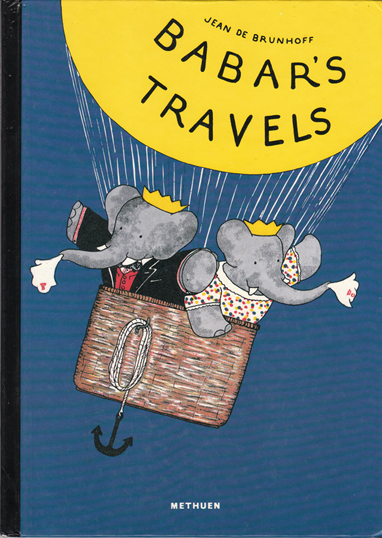 Pastedowns and endpapers depict a train of elephants – each holding the other's tail with his trunk – on a yellow background. Glazed pictorial boards. Head of spine has been lovingly nibbled by the previous owner! Corners lightly bumped. Internally, the book is effectively as new: pages are crisp, clean, and very tightly bound. Measures 28 cm × 20 cm (11.2″ × 8″). 4to. Unpaginated.